We will be adding all your Corpus Christi and surrounding area events here! Check back often because we will be updating. Also don't forget to check the Facebook page for the most up to date info. The Easter Bunny will be available for pictures from March 3rd through April 4th. Babies "R" Us Baby's First Easter at 10 am. An Easter event for your baby. Come in store and celebrate your special somebunny's first Easter with us. Bring baby dressed in your favorite Easter outfit and enjoy some "egg-celent" activities! A Bunny Hop with giveaways and prizes you’ll find along the way. Capture the day’s fun by taking pictures by our Easter backdrop. Find great gift ideas for baby's Easter basket. Janet F. Harte Public Library "Baskets and Bunnies" Celebration at 11:00 am. 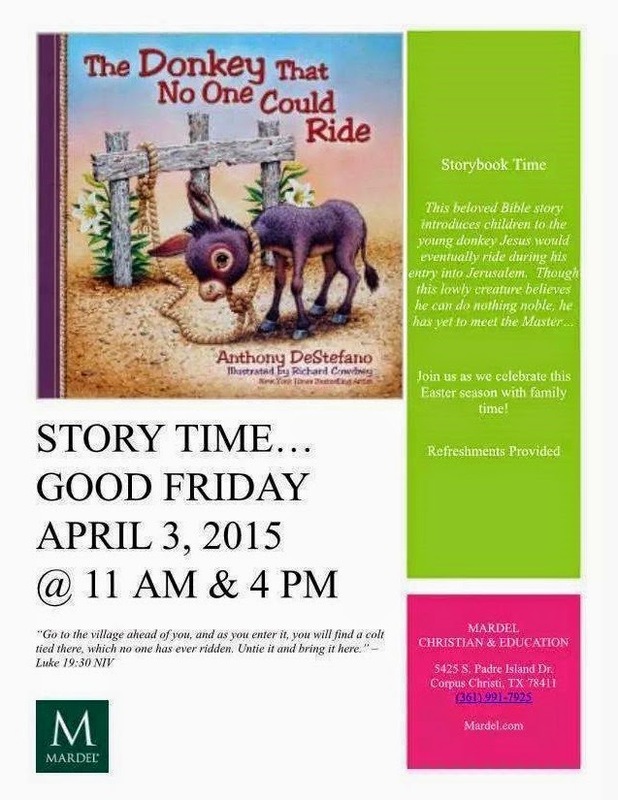 Celebrate Easter with Janet Harte Library! They will have dancing, crafts, and an Easter Egg Hunt. Don't forget your baskets and your cameras - they are inviting the Easter Bunny to drop by for pictures with your children! FREE and open to all ages. Dr. Clotilde P. Garcia Public Library Easter Egg Hunt at 3:00 pm. Come on out for a craft, story and fun! Don't forget your basket! For The Love Of Strays Spring Fest from 12 to 4 pm. Easter "Begg" hunt. Fun for the family and pets! MWR Spring Eggstravaganza from 10:00 to 1:00 pm. CCPD Bomb Squad, South Texas Lighthouse for the Blind and DARS - Division for Blind Services invite all children who are blind or visually impaired (and their immediate families) to join us for a unique Easter Egg Hunt at Buc Stadium. Beeping Easter Eggs constructed by the CCPD Bomb Squad will be placed on the football field for children with visual impairments to find. Tons of other great activities will be featured as well including a petting zoo, pony rides, duck pond, bouncy houses, face painting and much more! Event is free! To register a child, please call 361-289-8710. To be a sponsor, please call 361-693-6183. 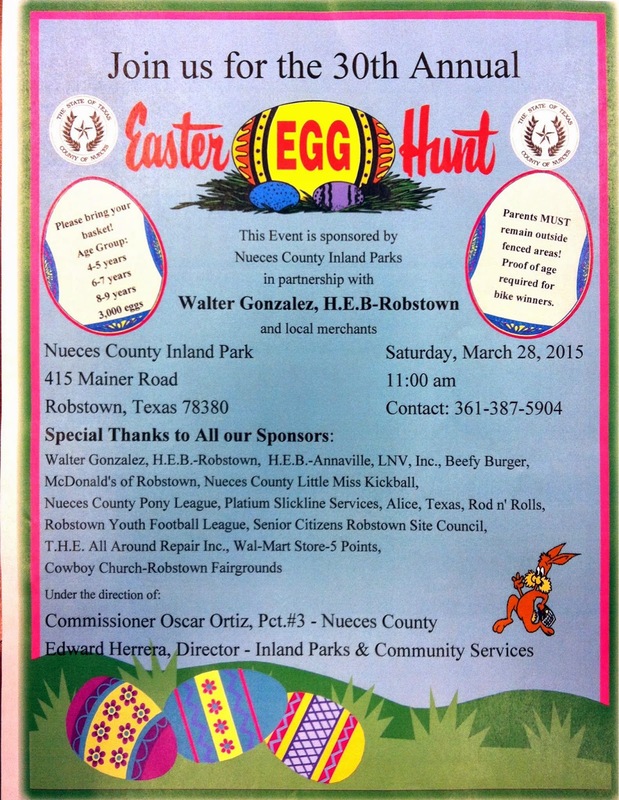 30th Annual Easter Egg Hunt at Nueces County Inland Park at 11:00 am. Over 3,000 eggs! Please bring your Easter basket. FREE event! 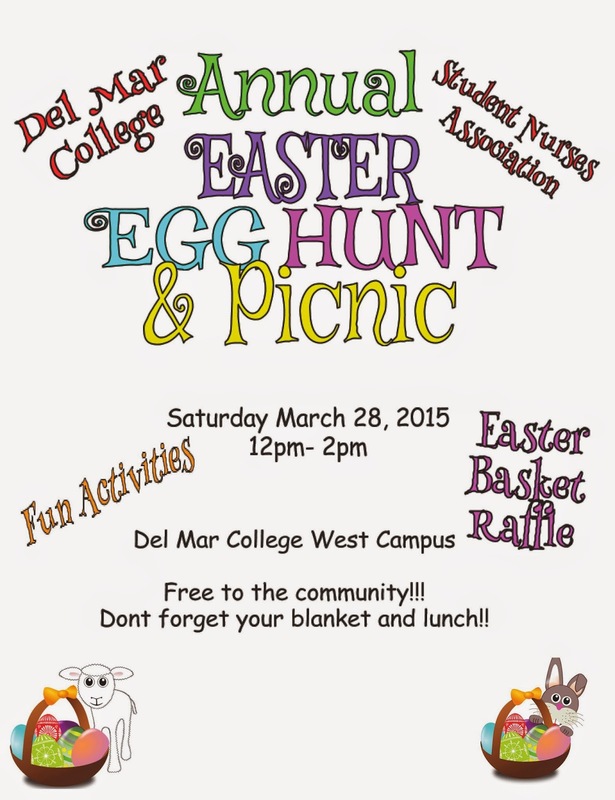 Del Mar College- Student Nurses Association Annual Easter Egg Hunt from 12 to 2 pm. Fun games, picnic, Easter basket raffle and egg hunt. The event will be held in the grassy area between the Health Sciences and ET building. Event is free to the public. Don't forget your blanket and sack lunch. Purchase raffle tickets this week or day of event from any SNA board member. 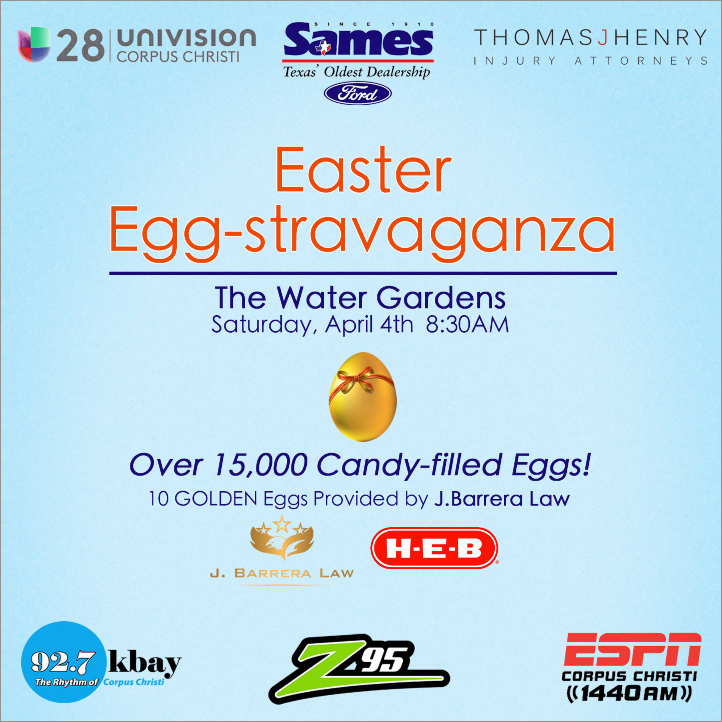 Corpus Christi Aquatics Easter Eggstravaganza from 1 to 4 pm! Egg hunt for children 12 and under starts at 1 pm and after there will be Arts and Crafts, Face painting and swimming. Only $4 per person! Easter Bunny Pictures with Copy Creators from 10 am to 8 pm. Photo's start at $10.00. Additional photos available. La Costa Dental FREE pictures with the Easter Bunny from 3:30 to 6 pm. Mardel Store Easter story time at 11 am and another at 4 pm. The story will be "The Donkey That No One Could Ride". There will be refreshments served. La Costa Dental FREE pictures with the Easter Bunny from 1:30 to 6 pm. IT'S GONNA BE HUGE! Easter egg hunts, science, snacks, theater performances, and a search for the Golden Egg! Take your picture with the Easter Bunny, a puppet show, Museum Live Theater, activities and lots of other cool stuff, not to mention a full museum to explore! Cornerstone Church "The Scramble" at 12:00 pm. Egg Hunts by Age Group • Games • Petting Zoo • Face Painting • Fire Truck • Silent Auction • Inflatables • Sno Cones • Popcorn • Hot Dogs • SWAT truck • Hay Ride • Easter Experience • Drinks • Coastal Bend Blood Center • Swing Ride • And More! Everything is free! Your “Admission Fee” is a non-perishable food item for Crossbridge Food Pantry. Aqua-Tots Swim Schools Corpus Christi Open Swim Easter Egg Hunt from 4:00 to 6:00 PM. Members $15 and non members $10. Guarantee your entrance with payment. Easter Eggstravaganza at 8:30 am. Free event with over 15,000 candy filled eggs! Kiwanis Club of Padre Island 18th Annual Island Easter Egg Hunt at 11 am. The free event features fun rides, inflatables, train, food, face painting, photos with the Easter Bunny, and much more. La Costa Dental FREE pictures with the Easter Bunny from 10:00 am to 6 pm. Fulton Mansion State Historic Site Easter Egg Hunt from 6:00 - 7:00 PM. Rockport's largest FREE Easter Egg Hunt. More than 5,000 candy and prize-filled eggs will be scattered across our grounds. Please arrive AT LEAST 15 minutes early to park and line up. We will have a designated area for small children to hunt. Church of Hope Helicopter Egg Drop 2015 starting at 9:00 am (after service). Impact City Church Easter Services at 11:45 am. Join us this Easter Sunday as we learn about the change that God has for all of us. They'll be egg hunts for the kids and plenty of BBQ after service . Allow us the honor of making you and your family feel at home this Easter here at Impact City Church. Meet in the Jackson Building, located on the Lexington Baptist Church Campus. 3525 S Padre Island Dr.
Cathedral of the Palms Easter Eggstravaganza from 4 to 8 pm. 15,000 Easter egg hunt! Fun for the whole family with food, games, and prizes for all ages! Free to the public.